New York, 27 March 2017: Negotiations on a new international treaty to prohibit nuclear weapons start today at the UN in New York. These talks give an historic opportunity for a vital step towards eliminating these weapons of mass destruction – as expected, the UK government is refusing to participate. The US has called a briefing to coincide with the start of negotiations and has asked the UK and other NATO states to stand next to them in protest. Such a treaty would put nuclear weapons alongside the other weapons of mass destruction – biological and chemical weapons – which are prohibited under international treaties. Nuclear-armed states were not expected to participate in the negotiations after it was clear that they would not be given the power to block the outcome. The majority of states think that nuclear weapons should be illegal because their horrific effects are incompatible with any legal and moral standards. Previous experience has shown that legal prohibition is the starting point for efforts to get rid of the weapons, building stigma and limiting financing to their production. The UK government has frequently stated its commitment to working multilaterally for nuclear disarmament. This is an international legal obligation for the UK as it is for other countries. Refusing to participate in talks that are open to all UN Member States shows that the UK government is not serious about achieving the total elimination of nuclear weapons. A recent poll showed that 75% of UK adults think that the government should participate in the UN negotiations. The majority of countries have recognised the moral and security imperative to prohibit nuclear weapons due to their catastrophic and unacceptable humanitarian consequences, and the severe risks of accidental or deliberate detonations. Aid agencies and the International Committee of the Red Cross say that there can be no meaningful humanitarian response to a nuclear detonation. The UK government has emphasised that it possesses “only 1%” of the world’s arsenal – but whether it holds 1% or 90%, these weapons remain abhorrent and dangerous, including to citizens of the UK. The transportation of nuclear weapons around the country inevitably and frequently puts communities at risk. 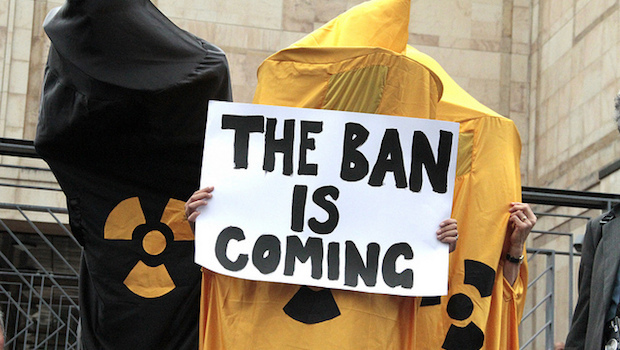 An international treaty prohibiting nuclear weapons is likely to be concluded in 2017, as soon as July. The UK’s boycott is putting this country on the wrong side of history. 113 states voted to start negotiations on an international treaty to prohibit nuclear weapons at the UN General Assembly in December 2016. The UK and some of the other nuclear-armed stated voted against the resolution. China, India and Pakistan abstained. The International Campaign to Abolish Nuclear Weapons (ICAN) is an international civil society campaign with over 400 partners in 100 countries.